veetoo’s Belfast video production company lead creative, Stephen Bradley, was commissioned to act as director of photography by international video production company Wall to Wall (The Voice, BBC) as part of a television series documenting some of the world’s best photographers for BBC Television. 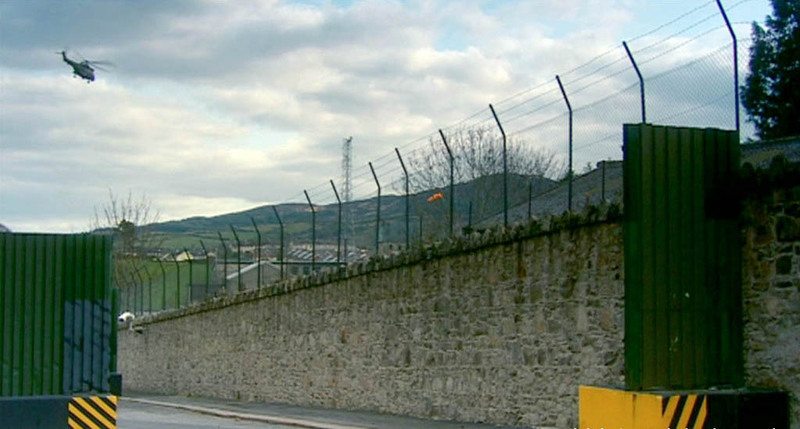 Stephen was tasked with filming Northern Irish photographer Donovan Wylie as he documented the British army dismantle their security watchtowers in Bessbrook, Northern Ireland as part of a book publishing commission. 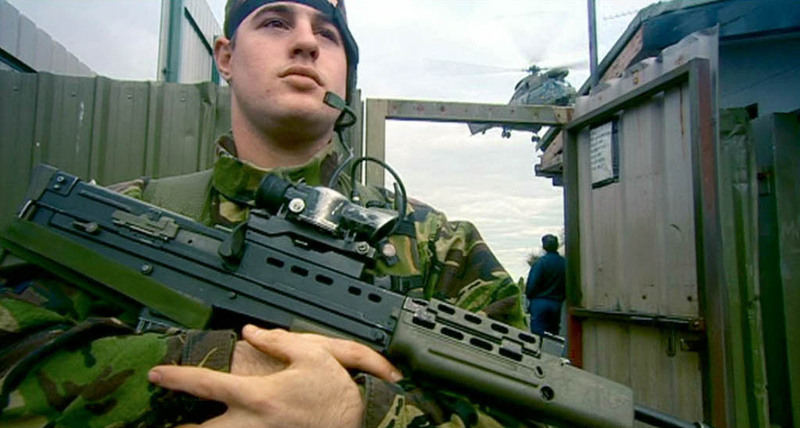 Stephen also built a documentary film crew and provided broadcast camera and sound equipment for the video shoot, ensuring delivery of imagery to the high standards demanded of Britain’s premier national television broadcast company. 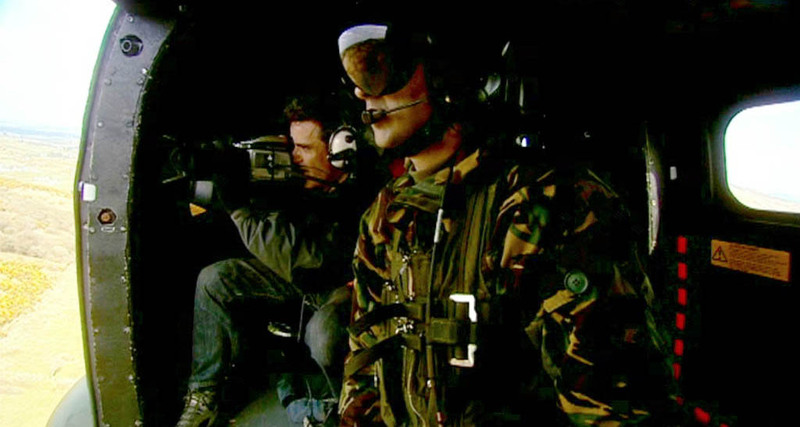 After filming Donovan preparing his equipment and heading off from his accommodation, we followed Donovan as he boarded an army helicopter and headed skyward on his way to the mountain top watchtowers he was to document during his photoshoot that day. Specialist sound recording equipment . As the director wanted to record conversations between Donovan Wylie and the helicopter pilot, our sound recordist installed specialist sound recording equipment into the Wessex helicopter’s internal communications equipment – allowing us to both see and hear Donovan as he tells the pilot exactly where he needs to be in the sky to get the best views of his subject matter. Black movie mist glass camera filter. Remote flat screen monitor (allowing the director to see everything being shot as it was recorded). Stereo digital sound recording equipment. Scroll down the page to see a screen shot photo storyboard depicting the main scenes from this video production. Establishing shot: Scene setting wide shot showing Magnum photographer, Donovan Wylie, in his bed and breakfast accommodation as he prepares his Hasselblad camera equipment before heading off on his assignment. We filmed this scene using natural light, coming from the window to the left of Donovan, and used a 6 by 4 foot silver reflector to bounce the light into the rooms interior. 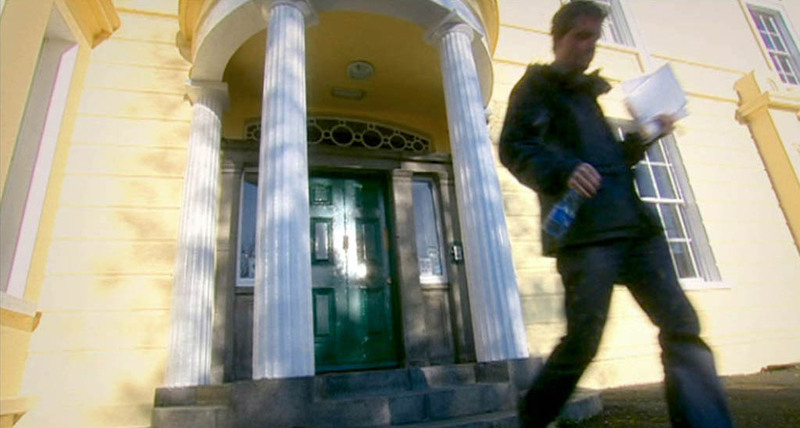 Exterior: Creating a dynamic perspective, as we filmed Donovan leaving his accommodation in Newry, allowed the director to build an emotional anticipation within the audience for the story that was to unfold later in the episode. Army garrison introduction: After filming Donovan waiting for his helicopter transport to arrive, we filmed first person to show what Donovan saw as he ran under the whirring blades and then climbed aboard the army helicopter when he was hauled onboard by a member of the helicopters crew. This image shows the cutaway that was then inserted in the edit to imply Donovan was now on board and rising skyward. 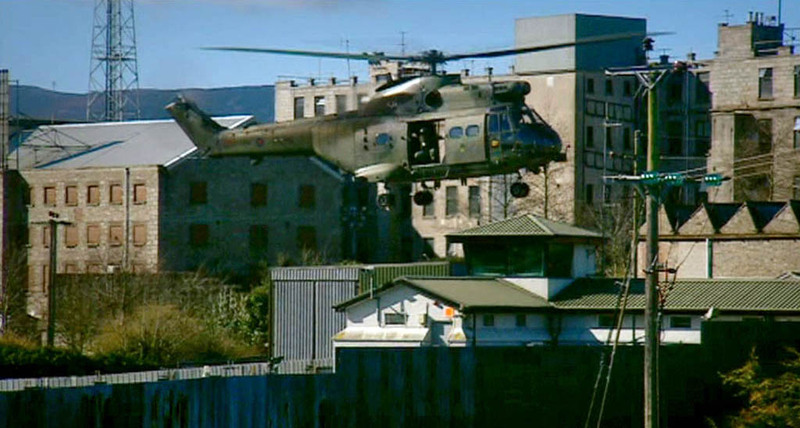 Army garrison (dynamic perspective): While this footage was shot after Donovan had returned from photographing the army lookout posts in South Armagh (the helicopter behind the squaddy was not that used by Donovan), this shot was added within the edit as another cutaway to indicate multiple cameras were filming as his helicopter fly skyward when, in fact, we had one camera crew filming everything. 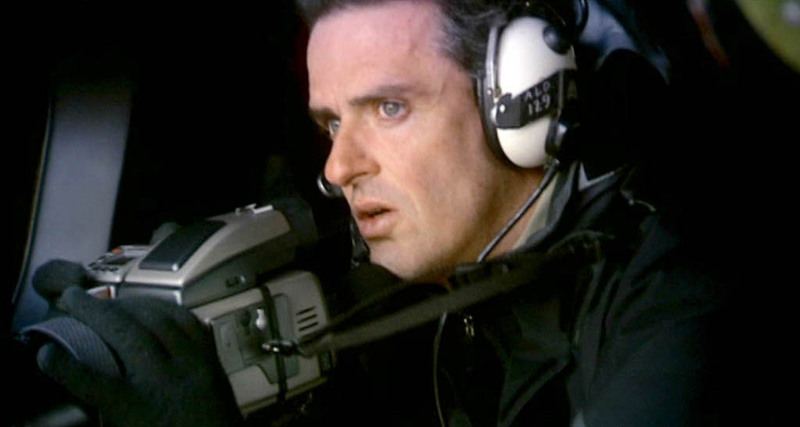 Smoke and mirrors: While the video shows multiple angles on Donovan’s helicopter leaving the army garrison, most images were not of his helicopter, but of others filmed at the end of filming at the army base. These were cut together in the edit to depict multiple ‘views’ of Donovan heading up and towards the hilltop watchtowers that he was photographing. Connecting with the person: Moving in for a tight shot that shows the intensity, intelligence and focus of one of the Magnum Photo Agency’s premier photographers, as he scans the landscape below for interesting imagery that will help clarify and build on his projects specific story. 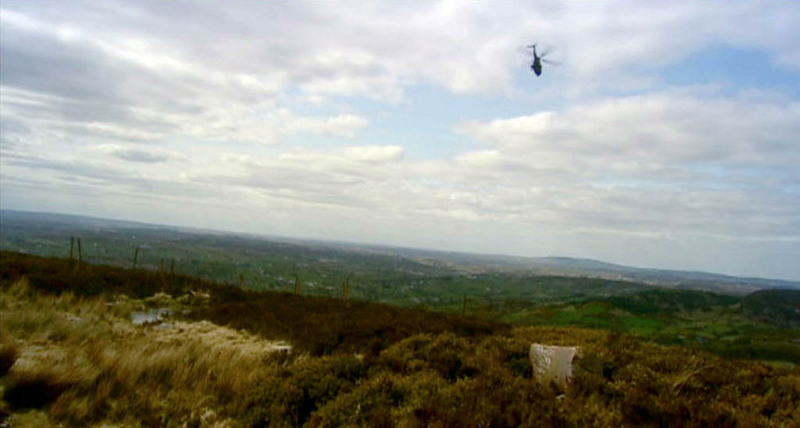 Through the eyes of the beholder: We then see what Donavan is looking at, as the army helicopter maneuvers to land at one of the army watchtowers being dismantled by soldiers prior to their leaving Northern Ireland and to their secure bases on the UK mainland. 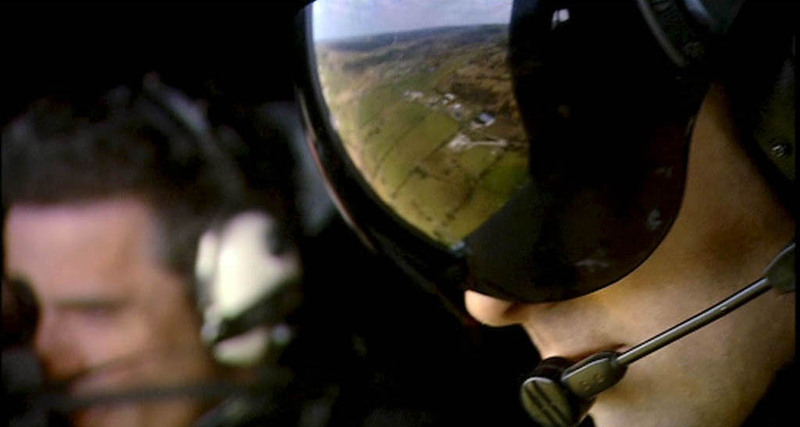 Reflections from above: Our camera operator focused on the visor of this helicopter crew member which was reflecting the imagery outside and which gave a single image overview of all that was happening at the time. Side by side: Any good creative will tell you that they are only as good as the people they work with, this medium shot was made to illustrate the relationship between photographer Donovan Wylie, the helicopter crew and the helicopter itself – all of which resulted in the creation of eye catching photographs that would not have been possible otherwise. 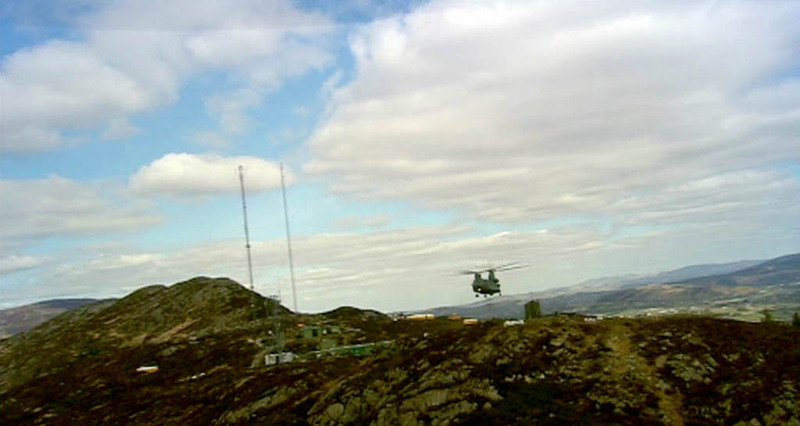 Continuing on: This wide shot was taken from ground level using a wide angle lens to accentuate the landscape and emphasise the smallness of the army Puma helicopter as it whisks Donovan on his journey of discovery from the Northern Irish skies.